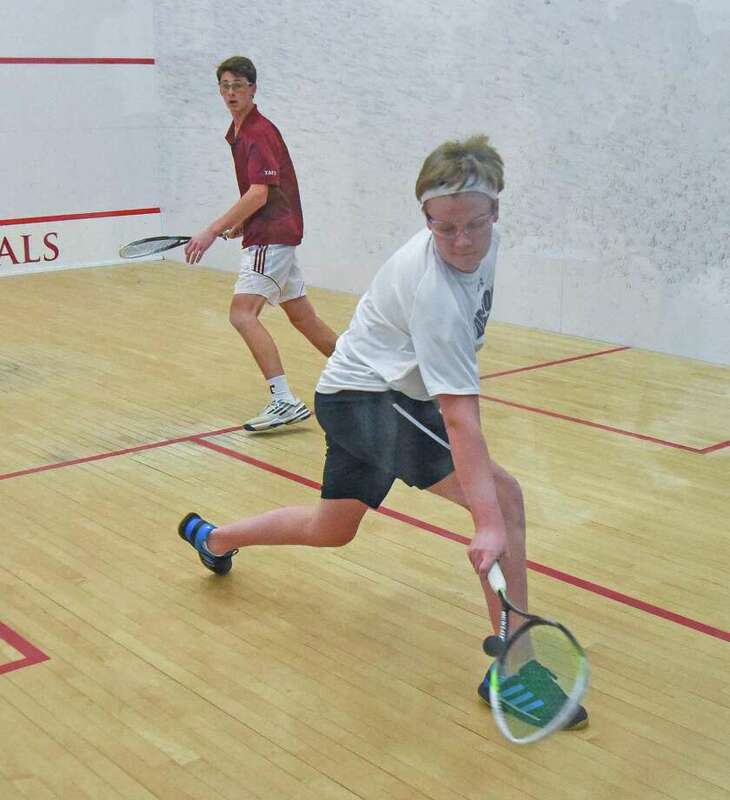 Marshall Bessey helped the GFA boys squash team advanc to the quarterfinals of the HEAD High School National Tournament at Wesleyan University on Saturday. Greens Farms Academy senior Henry Holzinger (Westport) had a very big week, both on the basketball court and off of it. Holzinger broke a school record with nine 3-pointers en route to 31 points as GFA defeated Redemption Christian Academy 92-71 to cap of Pack the House night at Coyle Gym on Friday. The effort bested the mark of Hunter Eggers (Greenwich) set in 2012. Greg Lawrence (Fairfield) added 19 points while Cole Prowitt-Smith (Fairfield) chipped in 17 more as the Dragons offense rolled. David Basich (Westport) added 12 more points. Prowitt-Smith came one rebound away from notching GFA’s second triple-double of the season as he finished with 10 assists and nine boards. Lawrence had 21 rebounds, Bennett Close had eight boards and Basich had four steals. One game earlier, GFA did get its first triple double in years but Lawrence’s big games of 12 points, 24 rebounds and 10 blocks wasn’t enough as Masters beat the Dragons 86-77. Prowitt-Smith and Holzinger combined for 44 points. Prowitt-Smith had 23 points while Holzinger had 21 with five 3-pointers. Holzinger also dished out eight assists. Bennett Close (Norwalk) added seven points and eight rebounds. Four Greens Farms Academy wrestlers were honored following Saturday's FAA championship matches at Rye Country Day School. GFA split the day as a team, going 2-2. The Dragons bested Hopkins 66-6 and Hamden Hall 45-24 while falling to Brunswick 66-17 and Rye Country Day 39-35. Three wrestlers earned All-FAA honors, including junior Griffin Seyfriend (Westport) and freshmen CJ Shea (Milford) and Nico Provo (Stratford). Senior Sam Stuart (Fairfield) earned All-FAA honorable mention. The GFA boys squash team notched a huge win on the road, pulling out a 4-3 win over Masters in a showdown that came down to the last game of the last match. It was Marshall Bessey (Darien) pulling out that 11-9 win in the fifth game, giving GFA the victory. Jeb Rooney (Darien), Blake Newcomer (Darien) and Giani Panariello (Westport) all earned 3-0 wins for GFA. With everybody playing up a slot in the line-up, the Dragons fell to Hopkins (7-0) and Holy Child (5-2), playing tough in both matches. In the Holy Child match, freshmen Lucy Nelson (Westport) and Samara Cohen (Westport) both earned victories. Nelson won 3-2 (12-10, 11-9, 9-11, 11-5, 11-13) while Cohen took a 3-2 win (7-11, 7-11, 11-3, 11-9, 13-11). Katherine Marcus (New Canaan) poured in 27 points to lead GFA to a 64-29 win over Montfort Academy as the Dragons kicked off Pack the House night with a big win. Georgie Grabowski (Stratford) added 11 points while Kristiana Modzelewski (Westport) chipped in six more. Marcus also had nine rebounds, 8 steals and three assists for the Dragons while MaryGrace DelliSanti (Wilton) hauled in six rebounds. Modzelewski, Kelly van Hoesen and Lilah McCormick each had five rebounds to the winning cause. Earlier in the week, though, the Dragons fell behind by 20 points at the half before storming back in the second half and falling by eight points to Sacred Heart, 52-44. Marcus scored 20 of her game-high 23 points in the second half to help the Dragons make things close. Kelly van Hoesen (Greenwich) added nine points, 14 rebounds and four steals while Grabowski scored eight points. Marcus added eight rebounds and two steals. GFA ended the week with a 67-41 loss at Chesire Academy. Marcus scored almost half of her team’s points, but it wasn’t enough as GFA behind 32-13 before putting together another good second half. Grabowski added 10 points to the GFA cause. Modzelewski grabbed eight rebounds for GFA while van Hoesen had six rebounds, four steals and three assists. Marcus also added seven rebounds. The Dragons hosted Fairfield Prep for a foil battle at the Fairfield Fencing Academy and it was GFA coming away with a dominant 14-2 win. Teddy Gartland (Darien), Zach Rothwell (Fairfield) and Caroline Telesz (Fairfield) all came away with 4-0 records on the day while Jackson went 2-2.